Picture it! Saturday, May 6, 2017. 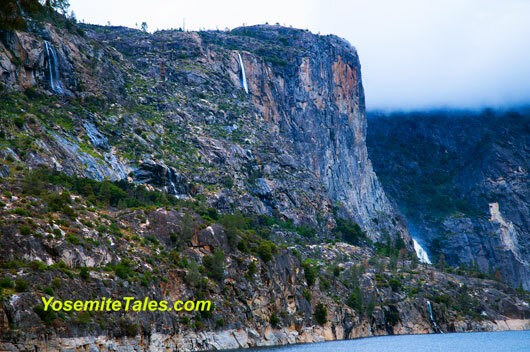 Hetch Hetchy Reservoir. 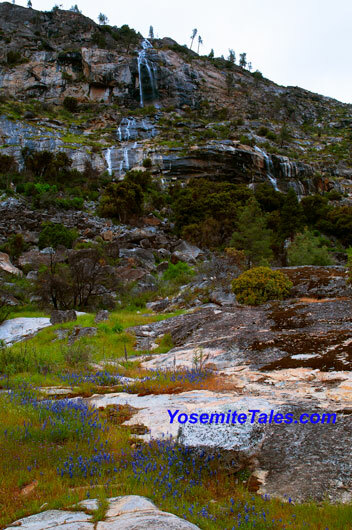 Tomorrow, May 7th, Restore Hetch Hetchy (HetchHetchy.org) has organized a hike along the north rim of the reservoir. I signed up to go on it. However, arriving early (because, “Why Not? I mean it’s Yosemite, right?”) I thought I’d just buzz over there and do the hike ahead of time, so I’ll know what to expect. Also, I can get some pictures (maybe) then tomorrow, I can focus on what the other members also on the hike are feeling. Anyway, I like to hike. Well, I guess, more accurately, I like to THINK I like to hike. The fact of the matter is I have trouble hiking DOWNHILL! But, it’s the beginning of the season and the hike is relatively flat and it’s only a couple miles (approaching, but not reaching, 5 miles round trip). So, I got this. I can do the hike both days. It’s about 1 PM when I start the hike. 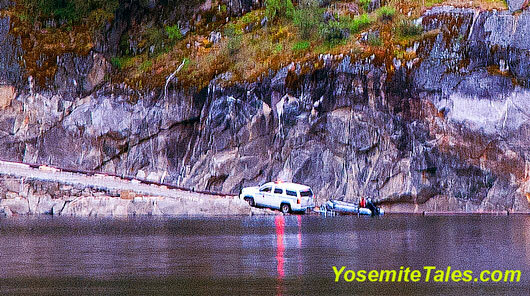 I had parked in the parking lot near the dam (downhill to the dam, damn). I’ve got my camera bag and tripod strapped over my shoulders. I also have some waters in a fanny pack. I have a walking stick. All I need now is a hoover board. The clouds hung low overhead, obscuring the tops of some of the taller peaks. I could still see at least 3 waterfalls from the dam. The trail over the dam and into the tunnel and past it for about 50 yards was flat. That was a wrap on the flatness. It never gained or lost more than about 300 feet, but it quickly took its toll on me. Not too far along I saw that some park rangers were strongly addressing a couple people that decided to boat on the reservoir. It seemed to take a while to coax them to come in. I guess it’s true, at least for a while, “It is better to beg for forgiveness than ask for permission”! I then came across a spectacular scene. It is May. Spring. Streams and Falls are in full force. Winter and its remnants can still be seen. Such as a treefall. Once such treefall made what I have to call is the most amazing crash I’ve ever seen. 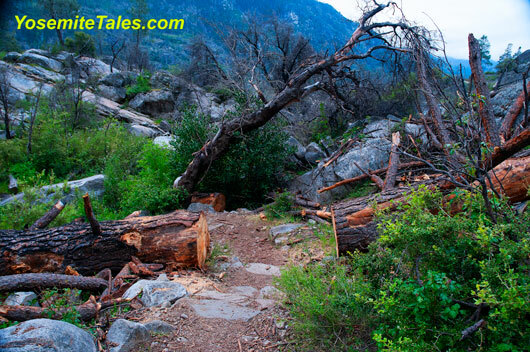 This one had the good grace to break itself up without obscuring the trail! Is this Amazing, or what? I don’t know about other parks that much. I’ve visited a few, but the visits are kind of “one-of”; I’m there to take a picture or two and then move on. With Yosemite, I feel apart of it. I know a little bit about its geology and, maybe, a bit more about its recent history; it isn’t just pretty face. There is context. There is relevance. True, Nature can be a harsh mistress. To, wit, Katrina, Hurricane Maria, and the vegetative scrap heap that can describe parts of “Mirror Meadow.” Nature can reveal some beautiful and amazing things. She out did herself with the majority of Yosemite. In few places is this more true than on this hike! 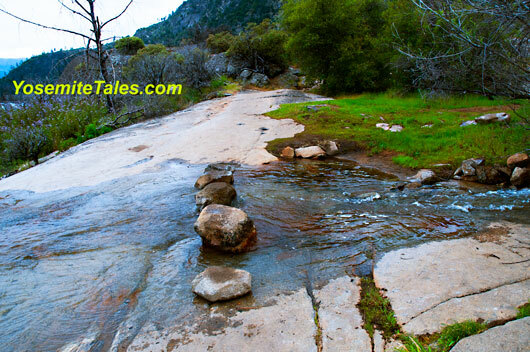 We all know that glacial retreat can leave boulders of various sizes strewn in any number of strange places. I have to say, though, the placement of these stones is truly remarkable. I have not heard of such an amazing alignment since I read of Gallio’s account discovering the moons of Jupiter! To be fair, this is even more extraordinary since history has shown that the alignment of Jupiter’s moons was the effect of a well-defined cause. THIS seems totally random! AND functional! So well placed are these stones that I was easily able to cross this stream without getting my, already soaked tennies any more wet! After coming up onto Tueeulala some fellow hikers coming the other way (from Wapama) said they saw a Mamma Bear and a cub up near the foot bridge. Interesting. Hmmmm. Looking at my watch. They are going to close the gate to the Hetch Hetchy area at 5 PM. I left on this hike at 1 PM. It’s now a quarter to four. I ask myself. Do I want to take yet another 10 to 20 minutes to negotiate my way around Ms. Bear, possibly being invited for lunch? Or shall I beat feet back the gate and try to make it before they close the gate? It could be argued that given it took me 2 and three quarter hours to get this far, the likelihood that I’d make it back to the dam (let alone getting back to the gate) in 1 hour and fifteen minutes was, at least, somewhat remote. Since I plan to take this trip tomorrow anyway, maybe discretion is the better part of valor. I turned and left. Smartly. In the morning I was walking like a chafed Weeble. I made my apologies to Spreck Rosecrans and the Restore Hetch Hetchy crew that I wouldn’t be able to make the hike after all. I continued to beat feet all the way back to Arizona.